One of the most important metrics to direct your attention to when evaluating your marketing strategy, is the return on your investment (ROI). Let’s take a look at some of the reasons why Search Engine Optimization is ranked as a top performer when it comes to making more than what you are spending. Increase In Traffic – Law firm SEO works much differently than SEM. With SEM, you get what you pay for. Each time your ad is clicked on, you pay for that click. After the ad is clicked, it is gone until you pay for that ad to reappear. 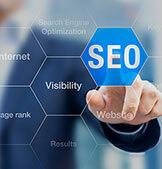 With SEO, you are getting your website to appear organically down the center of the Google results. When your site link is clicked, it doesn’t cost anything. Better yet, when the next person searches for your services, your website is still there. This means you can increase traffic to your site without increasing your advertising spend! About 60% of all clicks go to the number one search result. Simply put, if you haven’t utilized law firm SEO to get that top ranking, you are missing out on 60% of the opportunities! Credibility – Consumers are more educated on how Google searches work and that trend is not slowing down. The average consumer knows that anyone can pay to have an ad appear. They also know that it takes time and a credible company to appear at the top of the organic results. Digital marketing for lawyers means seeing your website at the top of the organic results, giving the potential client a sense of comfort and confidence that they look for when hiring an attorney. Check your SEO status right now!